The growth in business of scheduled commercial banks (SCBs) slowed as was reflected in a further decline in both deposit and credit growth. The gross non-performing advances (GNPAs) ratio increased between March and September 2015, whereas, the restructured standard advances ratio declined during the same period. 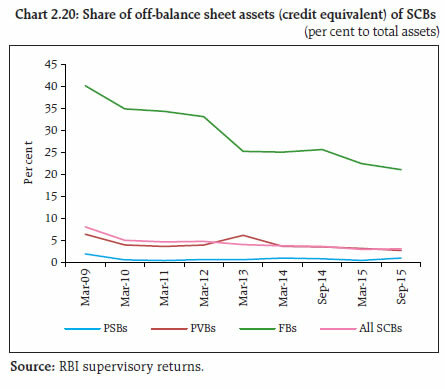 The capital to risk-weighted assets ratio (CRAR) of SCBs registered some deterioration during the first half of 2015-16. Public sector banks (PSBs) continued to record the lowest CRAR among the bank groups. Profitability of SCBs deteriorated further. 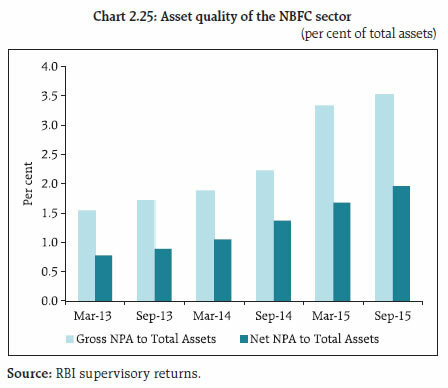 The asset quality of both scheduled urban co-operative banks (SUCBs) and non-banking financial companies (NBFCs) deteriorated during the first half of 2015-16. 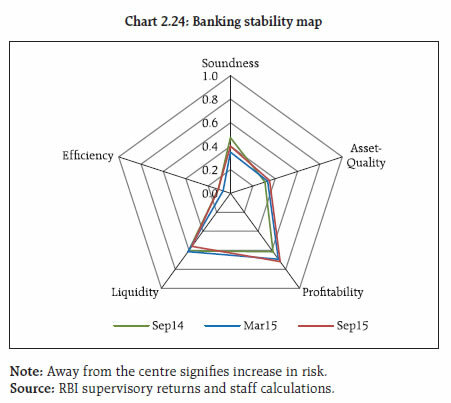 The banking stability map indicates that risks to the banking sector increased during the half year ended September 2015 due to deteriorating asset quality, lower soundness and sluggish profitability. While stress tests reveal resilience, the system could become vulnerable if the macroeconomic conditions deteriorate sharply. 2.1 In this section, the soundness and resilience of scheduled commercial banks2 (SCBs) are discussed under two broad sub-heads: banks’ performance on their different functional aspects and their resilience using macro-stress tests through scenarios and single factor sensitivity analysis. 2.2 Credit growth of all SCBs, on a y-o-y basis, further declined to 9.4 per cent from 9.7 per cent while the growth in deposits declined to 9.9 per cent from 10.7 per cent between March 2015 and September 2015. 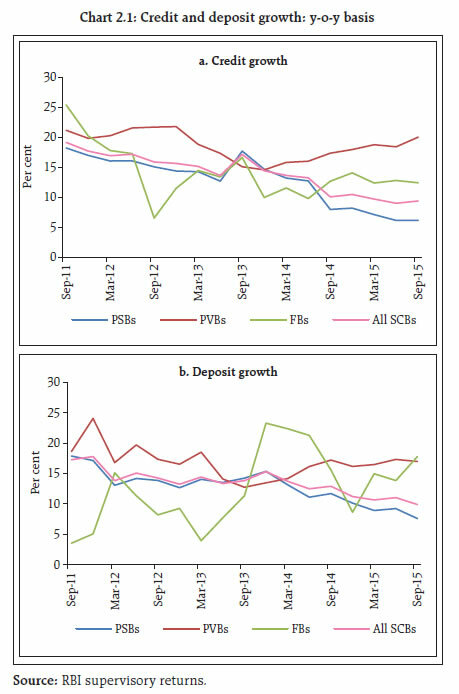 Within the bank-groups, public sector banks (PSBs) continued to register subdued performance in credit as well as deposits, whereas private sector banks (PVBs) and foreign banks (FBs) showed robust growth during the same period (Chart 2.1). 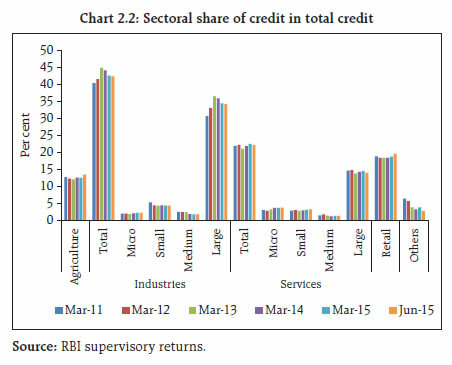 2.3 Within the broad sectors, credit to ‘industries’ declined, mainly due to a decline in the share of credit to medium and large industries. The share of the retail segment in total credit went up (Chart 2.2). 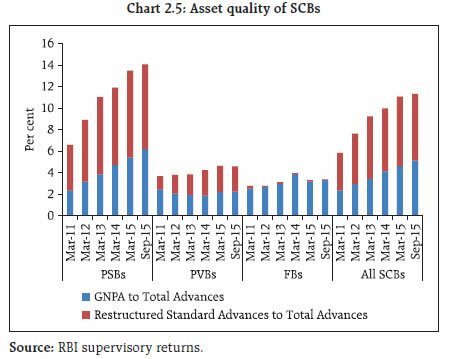 2.4 The capital to risk-weighted assets ratio (CRAR) of SCBs at the system level declined to 12.7 per cent from 13.0 per cent between March and September 2015, whereas, Tier-I leverage ratio3 increased to 6.5 per cent from 6.4 per cent during the same period (Charts 2.3 and 2.4). 2.5 Gross non-performing advances4 (GNPAs) of SCBs as percentage of gross advances increased to 5.1 per cent from 4.6 per cent between March and September 2015. The restructured standard advances as percentage of gross advances declined to 6.2 per cent from 6.4 per cent, while the stressed advances5 ratio increased to 11.3 per cent from 11.1 per cent during the same period. PSBs recorded the highest level of stressed assets at 14.1 per cent followed by PVBs at 4.6 per cent and FBs at 3.4 per cent. The net non-performing advances (NNPAs) as a percentage of the total net advances for all SCBs increased to 2.8 per cent from 2.5 per cent during the same period. At the bank group level, the NNPA ratio of PSBs increased from 3.2 per cent to 3.6 per cent, whereas, in the case of PVBs and FBs it remained unchanged at 0.9 per cent and 0.5 per cent respectively (Charts 2.5 and 2.6). 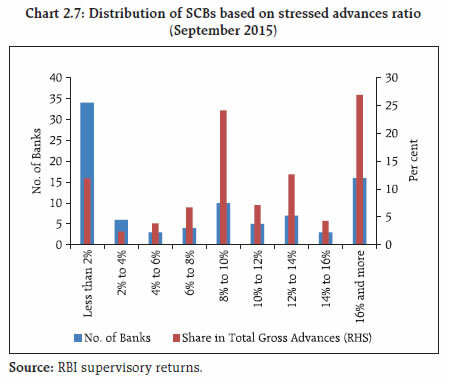 2.6 As of September 2015, 34 SCBs with 12 per cent share in advances showed very low stressed advances ratio of less than 2 per cent, whereas, 16 banks with 27 per cent share in advances had high stressed advances ratio of over 16 per cent (Chart 2.7). 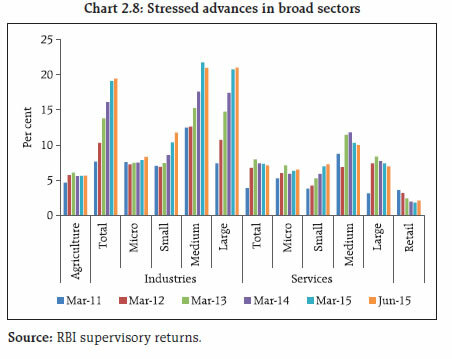 2.7 Sectoral data as of June 2015 indicates that among the broad sectors, industry continued to record the highest stressed advances ratio of about 19.5 per cent, followed by services at 7 per cent. The retail sector recorded the lowest stressed advances ratio at 2 per cent. In terms of size, medium and large industries each had stressed advances ratio at 21 per cent, whereas, in the case of micro industries, the ratio stood at over 8 per cent (Chart 2.8). 2.8 Five sub-sectors viz. mining, iron & steel, textiles, infrastructure and aviation, which together constituted 24.2 per cent of the total advances of SCBs as of June 2015, contributed to 53.0 per cent of the total stressed advances. Stressed advances in the aviation sector6 increased to 61.0 per cent in June 2015 from 58.9 per cent in March, while stressed advances of the infrastructure sector increased to 24.0 per cent from 22.9 per cent during the same period. The performance of these sectors and their impact on the asset quality of banks continue to be a matter of concern (Chart 2.9). 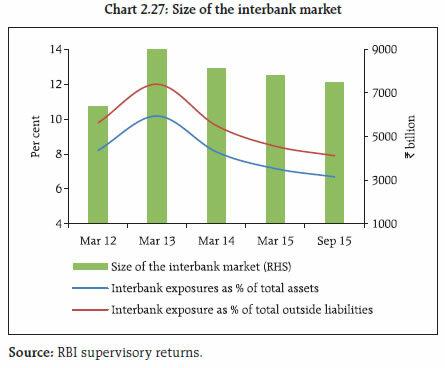 2.9 In its continuous and sustained endeavour to address NPAs in the banking system and with a mandate of activating and coordinating the mechanism to manage stressed assets in the economy so that transparent credit information becomes available for sound risk management and financial stability, the Reserve Bank introduced a ‘Framework for Revitalising Distressed Assets in the Economy’8 in January 2014. As part of this initiative, the Reserve Bank set up the Central Repository of Information on Large Credits (CRILC) to collect, store and disseminate credit data to lenders. CRILC’s main objective is two-fold – (i) early recognition of asset quality problems by reducing information asymmetry and (ii) helping banks to take informed credit decisions. Banks are required to furnish credit information to CRILC on all their borrowers having aggregate fund-based and non-fund based exposure of ₹50 million and above. 2.10 A significant increase in the GNPA ratios of large borrowers among PSBs from 6.1 per cent in March 2015 to 8.1 per cent in September 2015, led to an increase in the GNPA ratio of the banking system. The GNPA ratio of FBs, however, declined during the same period (Chart 2.10). 2.11 Standard assets among large borrowers declined from 86.2 per cent of total gross advances as of March 2015 to 84.5 per cent as of September 2015. Credit to top 100 large borrowers (in terms of funded amount outstanding) constituted 27.6 per cent of the credit to all large borrowers and 17.8 per cent of the credit of all SCBs. 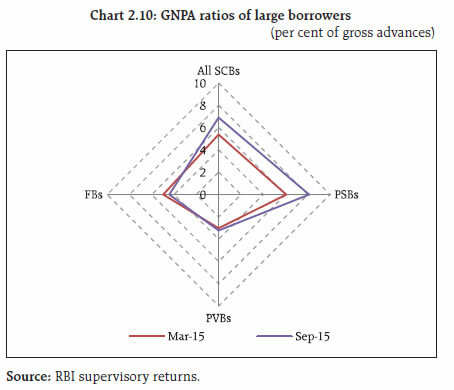 The share of GNPAs of these borrowers in total GNPAs of all SCBs increased sharply from 0.7 per cent in March 2015 to 3.1 per cent in September 2015 (Table 2.1). 2.13 Both return on assets (RoA) and return on equity (RoE) declined further to 0.7 per cent and 8.5 per cent respectively as of September 2015 from 0.8 per cent and 9.3 per cent as of March 2015. Profit after tax (PAT) of SCBs declined by 4.4 per cent during the first half of the financial year 2015-16, due to lower growth in earnings before provisions and taxes (EBPT) and higher provisions and write-offs (Table 2.2). Among the bank groups, PAT declined by 22.7 per cent for PSBs, whereas, it increased by 11.5 per cent for PVBs and 4.6 per cent for FBs during the same period. Note: RoA and RoE are annual figures, whereas the growth is calculated on a y-o-y basis. 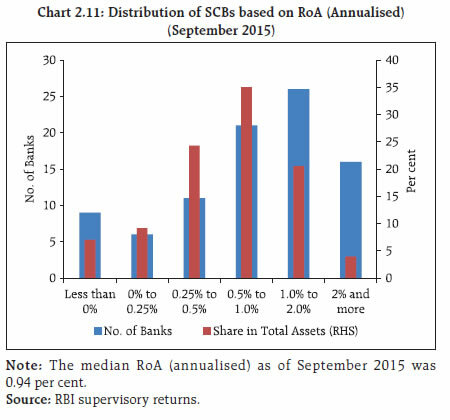 2.14 Bank-wise distribution of RoA (annualised) shows that nine SCBs with a share of 7 per cent in the total assets recorded negative RoA during first half of the financial year 2015-16. Further, six banks with a share of 9 per cent in total assets recorded RoA in the range of zero to 0.25 per cent (Chart 2.11). 2.16 The macro stress test for credit risk suggests that under the baseline scenario, the GNPA ratio may rise to 5.4 per cent by September 2016 from 5.1 per cent in September 2015, but could subsequently improve to 5.2 per cent by March 2017. However, if the macroeconomic conditions deteriorate, the GNPA ratio may increase further, and it could rise to around 6.9 per cent by March 2017 under a severe stress scenario. 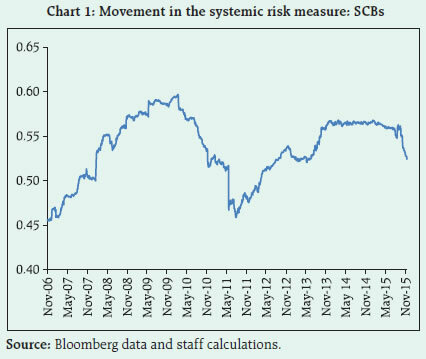 Under such a scenario, the system level CRAR of SCBs could decline to 10.4 per cent by March 2017 from 12.7 per cent as of September 2015 (Chart 2.12). 2.17 Among the bank-groups, PSBs might continue to register the highest GNPA ratio. Under the baseline scenario, their GNPA ratio may go up to 6.3 per cent by September 2016 from 6.2 per cent as of September 2015 and may improve thereafter to 5.8 per cent in March 2017. However, under a severe stress scenario, it may increase to 8.0 per cent by March 2017. Under the baseline scenario, the GNPA ratio of PVBs may increase to 2.5 per cent by March 2017 from 2.2 per cent as of September 2015, but under severe stress scenario this may go up to 4.9 per cent (Chart 2.13). 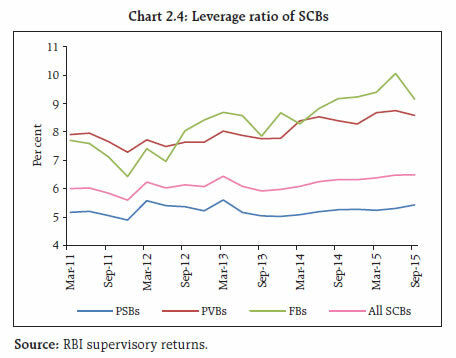 2.18 Under a severe stress scenario, PSBs may record the lowest CRAR of around 9.4 per cent by March 2017, as against 11.5 per cent as of September 2015 (Chart 2.13). 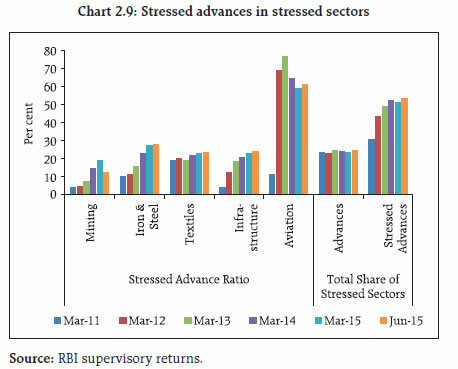 2.19 Macro-stress test for sectoral credit risk revealed that in a severe stress scenario, among the select seven sectors, engineering, which had the highest GNPA ratio at 8.5 per cent as of September 2015, could see their GNPA ratio moving up to 14.5 per cent by March 2017 followed by iron & steel (from 8.4 per cent to 11.5 per cent) and cement (from 6.4 per cent to 11.2 per cent) (Chart 2.14). 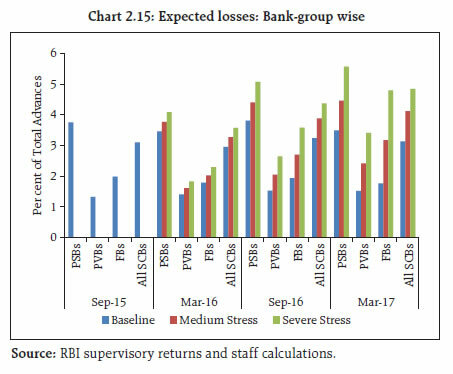 2.20 The provisioning13 levels of various bank groups as a percentage of their total advances were 3.8 per cent for PSBs, 2.0 per cent for PVBs and 3.6 per cent for FBs as of September 2015, which are above their estimated expected losses (EL) in the baseline scenario. EL as a proportion of total advances was highest in the case of PSBs and under a severe stress scenario, the present provisioning level seems to be short of meeting EL in general14 (Chart 2.15). 2.21 The estimated unexpected losses (UL) and expected shortfalls (ES) of various bank groups, on account of credit risk, under severe macroeconomic stress conditions are expected to be much lower than their present level of total capital (Tier I plus Tier II). 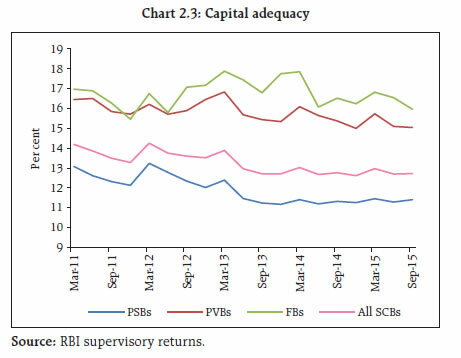 The level of total capital as per cent of total advances15 were at 13.1 per cent for PSBs, 20.6 per cent for PVBs and 33.3 per cent FBs as of March 2015 (Chart 2.16). 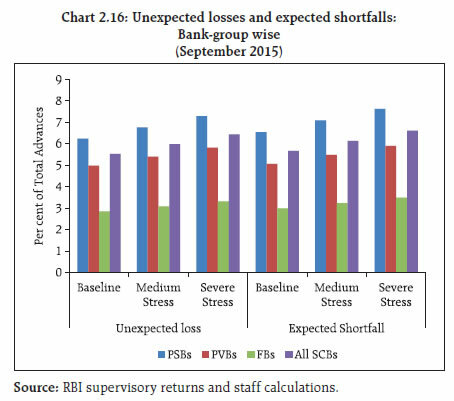 2.22 Bank-wise16 estimates of (select 60 banks) EL and UL, show that 19 banks (against 16 banks reported in FSR June 2015), which had 36.2 per cent share in the total advances, were unable to meet their expected losses with their existing provisions. On the other hand, there were five banks (with 2.4 per cent share in the total advances of select banks) which were expected to have higher unexpected losses than their total capital (Chart 2.17). 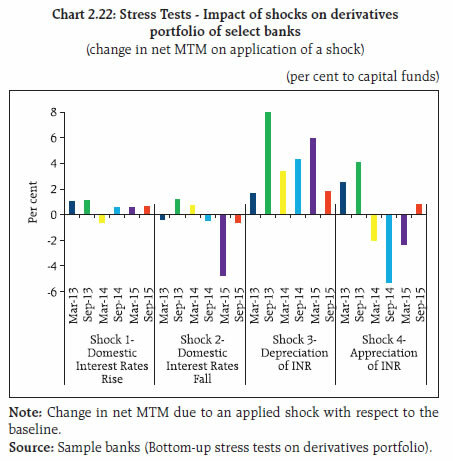 2.24 The impact of different static credit shocks for banks shows that the system level CRAR (under assumed stress scenario) will remain above the required minimum of 9 per cent. For instance, under severe shock of 3 SD20 (that is, if the GNPA ratio rises to 11.2 percent from 5.2 per cent), the system level CRAR will decline to 9.9 per cent and the system level Tier-1 CRAR to 7.3 per cent. The capital losses at the system level could be around 23.4 per cent. The impact of these shocks on profit will be more severe with the SCBs losing the entire profit if the NPAs moves up by 1.5 SD to 8.3 per cent (Table 2.4). The PSBs are found to be severely impacted under these stress tests where their CRAR will fall below 9 per cent under the shock of 3 SD increase in their NPAs. Under the assumed shock, CRAR of all PSBs, except three, will fall below 9 per cent. 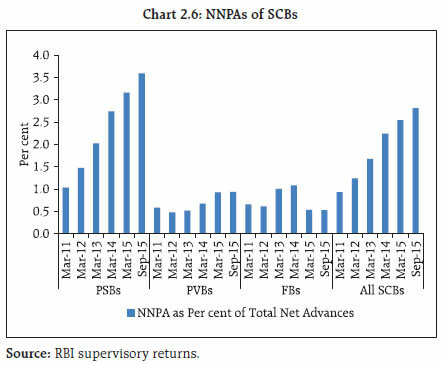 At the individual bank-level, 28 banks with a share of 50.4 percent of SCBs’ total assets will fail to maintain the required CRAR under the shock of a large 3 SD increase in NPAs (Chart 2.18). * System of select 60 SCBs. Source: RBI Supervisory returns and staff calculations. 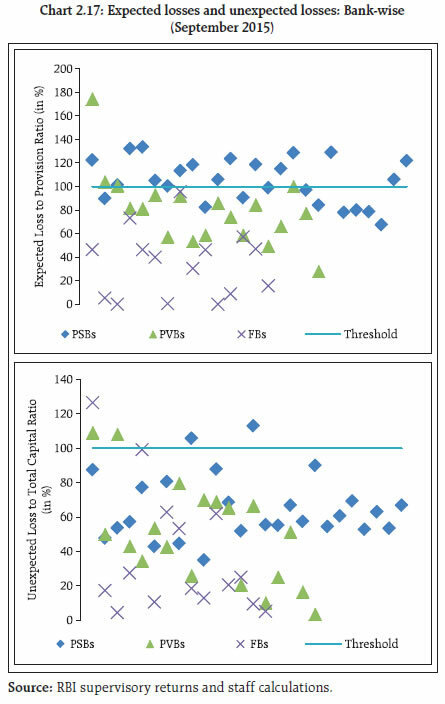 2.25 Stress tests on the credit concentration risks of banks, considering the individual borrowers show that the impact (under three different scenarios) was significant for seven banks, comprising about 6.1 per cent of the assets, which may fail to maintain 9 per cent CRAR in at least one of the scenarios. Capital losses under the assumed scenarios of default of the top most borrower could be around 5 per cent. Default of the top two borrowers could result in capital losses of 9 per cent, while 13 per cent losses could occur in case the three top individual borrowers default. The impact on profit before tax (PBT) could be 112 per cent for default of the top three individual borrowers. The impact could be 41 per cent of PBT under the scenarios of default of topmost individual borrower and 71 per cent in case the top two individual borrowers default. The impact on CRAR at the system level under the assumed scenarios of default of the top one, two and three individual borrowers will be 54, 94 and 262 basis points (Chart 2.19). 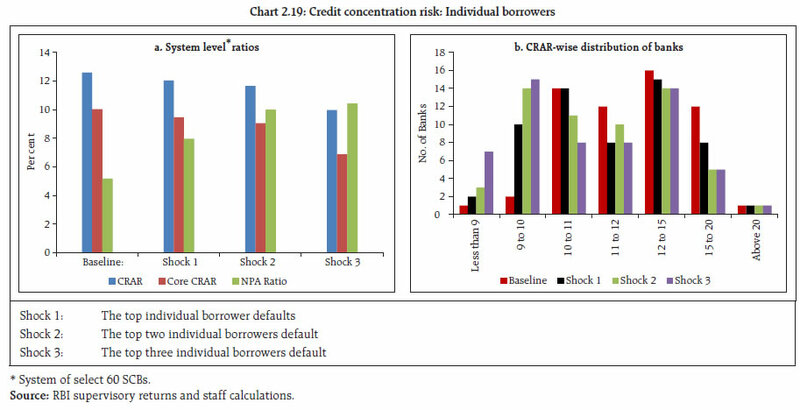 2.26 Stress tests using 10 different scenarios, based on the information of group borrowers on the credit concentration risk of banks reveal that the impact on the capital could be severe if more group borrowers default. The losses could be around 6 per cent and 10 per cent at the system level under the assumed scenarios of default of the top one group borrower and top two group borrowers. The losses could be 19 per cent of capital in case of default of five group borrowers and this could be as high as 30 per cent of capital if 10 group borrowers default in severe stress conditions. 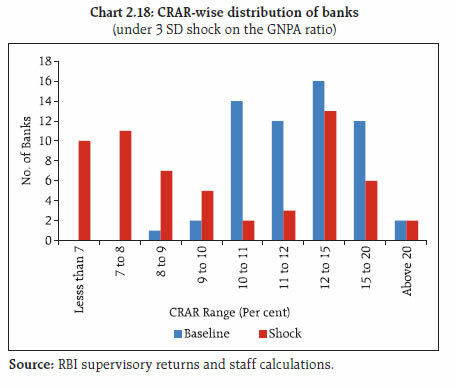 As many as 27 banks will not be able to maintain their CRAR level at 9 per cent in such severe conditions (Table 2.5). 2.27 Credit risk arising from exposure to a few important sectors, especially to industries was examined through sectoral credit stress tests.21 It was assumed that a portion of existing restructured standard advances would turn into NPAs accompanied by a shock on other standard advances in each sector. The results of sensitivity analysis revealed that the shocks would significantly increase system level GNPAs, with the most significant effect of the single sector shock being on the iron & steel sector (Table 2.6). The impact of the shock on capital ratios was limited given that only a portion of the credit portfolio was subjected to shock. However, there could be a significant impact on banks’ profitability (profit before tax). Note: * System of select 60 banks. # Shock assumes increase in Sectoral NPAs by a fixed percentage. The new NPAs arising out of standard advances (other than restructured standard advances) have been assumed to become sub-standard in the shock scenario. 2.28 Sectoral credit stress tests were also conducted for the infrastructure segment, including a few important sub-sectors of power, transport and telecommunications. The tests revealed that the shocks to the infrastructure segment will significantly impact the system with the most significant effect of the single sector shock being on the power and transport sectors (Table 2.7). * System of select 60 banks. 2.29 An analysis of a few specific sensitive sectors to sectoral credit shocks was also undertaken.22 The analysis considered engineering, automobiles, construction and cement industries. The results of sensitivity analysis revealed that the shocks will significantly increase system level GNPAs, with the most significant effect of the single industry shock being on engineering (Table 2.8). # Shock assumes a fixed percentage increase in Sectoral NPAs ratio (incremental shock on NPA ratio- addition on existing NPA ratio). The new NPAs arising out of standard advances have been assumed to be distributed among different asset classes (following existing pattern) in the shock scenario. 2.30 The interest rate risk arising from a parallel upward shift of 2.5 percentage points in the available for sale (AFS) and held for trading (HFT) portfolios of banks (direct impact) appears manageable as the impact on CRAR will be about 94 basis points at the system level. The reduction in CRAR was 92 basis points as reported in FSR-June 201523 for the same shock. At the disaggregated level, eight banks comprising 9.2 per cent of the total assets were impacted adversely and their CRAR fell below 9 per cent. The total capital loss at the system level was estimated to be about 8.4 per cent. The assumed shock of 2.5 percentage points parallel upward shift of the yield curve on the HTM portfolios of banks, if marked-to-market, will markedly reduce CRAR by about 233 basis points adversely impacting 22 banks, whose CRAR fell below 9 per cent (the impact was 276 basis points as assessed in FSR June 2015). The income impact on the banking book24 of SCBs could be about 53.7 per cent of their profit (before tax) under the assumed shock of a parallel downward shift (2.5 percentage points) in the yield curve. 2.31 A bank group level analysis (using only select banks for stress testing) of the impact of a shock of 2.5 percentage points parallel upward shift of the yield curve in the trading book reveals that PSBs may witness reduction in CRAR at 106 basis points (bps) compared to PVBs (55 bps) and FBs (144 bps) mainly because of higher rate sensitivity of investments in trading books (indicated by the modified duration) of these banks. The foreign banks had a higher impact due to their large exposure in trading books (Table 2.9). 2.32 The liquidity risk analysis captures the impact of assumed scenarios on banks where deposit run-off as well as increased demand for the unutilised portion of credit lines which are sanctioned/committed (taking into account the undrawn working capital limit and undrawn committed lines of credit) were considered. In assumed scenarios, there will be increased withdrawals of a portion of un-insured deposits and simultaneously there will be increased demand for credit on account of withdrawal of the unutilised portion of sanctioned working capital limits as well as credit commitments of banks towards their customers. It is presumed that banks will be required to meet these using their stock of liquid assets (full or a portion of the SLR portfolio) only, with no external funding factored in. A 10 per cent haircut/ margin has been assumed on the investments. The tests were conducted for SCBs based on September 2015 data. 2.33 In the first case, it is assumed that full SLR investments and the excess CRR will be available to banks to support their liquidity requirements in the stress scenario, which may be through specific policy measures taken during a crisis. The impacts are given in Table 2.10. 2.34 The analysis shows that though there will be liquidity pressure under the stress scenarios, most banks can withstand sudden and unexpected withdrawals of around 25 per cent of deposits along with the utilisation of 75 per cent of their committed credit lines with the help of their statutory liquidity ratio (SLR) investments. 2.35 In view of the implementation of the liquidity coverage ratio (LCR)28 with effect from January 1, 2015 in India, the definition of liquid assets was revised for stress testing. It is assumed that banks will use their high quality liquid assets (HQLAs)29 for meeting their day-to-day liquidity requirements. 2.36 In the second case, it is considered that the readily available LCR funds will help banks withstand the initial shocks. The impacts are given in Table 2.11. 2.37 This analysis shows that with the implementation of LCR, most banks will remain resilient in a scenario of assumed sudden and unexpected withdrawals of around 5 to 7 per cent of deposits along with the utilisation of 75 per cent of their committed credit lines with the help of their available HQLAs. In case of incremental shocks in an extreme crisis, banks will also be able to withstand further withdrawal of deposits using their remaining SLR investments through specific policy measures taken as per the requirements. 2.38 The share of off-balance sheet exposures of SCBs in their total assets have recorded a declining trend in the recent past. FBs continued to have a very high share of off-balance sheet assets in their total assets as compared to other bank groups (Chart 2.20). 2.39 A series of bottom-up stress tests (sensitivity analyses) on derivatives portfolio were conducted for select sample banks32 with the reference date as on September 30, 2015. The banks in the sample, reported the results of four separate shocks on interest and foreign exchange rates. The shocks on interest rates ranged from 100 to 250 basis points, while 20 per cent appreciation/depreciation shocks were assumed for foreign exchange rates. The stress tests were carried out for individual shocks on a standalone basis. 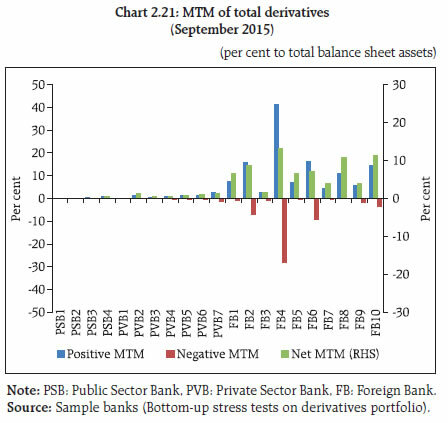 2.40 In the sample, the marked-to-market (MTM) value of the derivatives portfolio for the banks as on September 30, 2015 varied with PSBs and PVBs registering small MTM, while FBs had a relatively large positive as well as negative MTM. Most of the banks had positive net MTM (Chart 2.21). 2.41 The stress test results showed that the average net impact of interest rate shocks on sample banks were not very high. The foreign exchange shock scenarios also showed relatively lower impact in September 2015 (Chart 2.22). 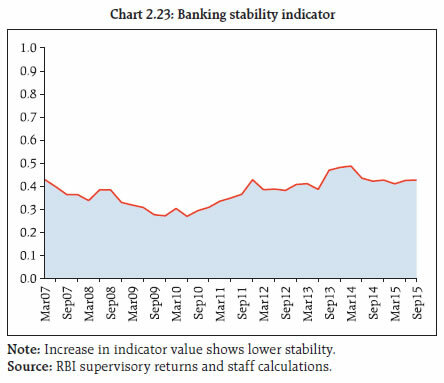 2.42 The Banking Stability Indicator (BSI),33 shows that risks to the banking sector have increased since the publication of the previous FSR.34 A trend analysis of BSI suggests that the stability conditions in the banking sector have started deteriorating since mid- 2010. The factors contributing towards an increase in risks during the current half-year are deteriorating asset quality, lower soundness and sluggish profitability (Charts 2.23 and 2.24). 2.43 At the system level,35 CRAR of scheduled urban co-operative banks (SUCBs) increased from 12.5 per cent to 12.7 per cent between March and September 2015. However, at a disaggregated level, five banks failed to maintain the minimum required CRAR of 9 per cent. GNPAs of SUCBs increased considerably from 6.1 per cent to 7.7 per cent and their provision coverage ratio declined to 51.2 per cent from 55.7 per cent during the same period. While RoA marginally increased from 0.7 per cent to 0.8 per cent, the liquidity ratio36 marginally declined from 35.3 per cent to 35.0 per cent during the same period. 2.44 A stress test for assessing credit risk was carried out for SUCBs using the data as of September 2015. 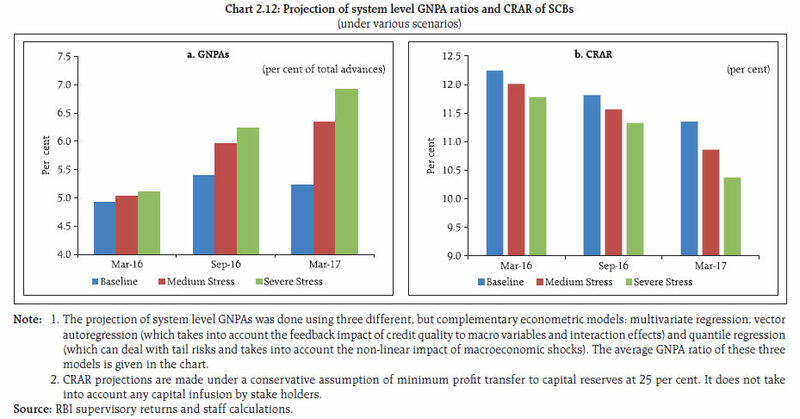 The impact of credit risk shocks on CRAR of SUCBs was observed under four different scenarios.37 The results show that except under the extreme scenario (one SD increase in GNPAs which are classified as loss advances), the system level CRAR of SUCBs remained above the minimum regulatory required level. However, individually, a large number of banks (30 out of 50) will not be able to meet the required CRAR levels under the extreme scenario. 2.45 A stress test on liquidity risk was carried out using two different scenarios; i) 50 per cent and ii) 100 per cent increase in cash outflows, in the one to 28 days’ time bucket. It was further assumed that there was no change in cash inflows under both the scenarios. The stress test results indicate that SUCBs will be significantly impacted under a stress scenario (out of 50 banks, 27 banks under scenario I and 38 banks under scenario II) and will face liquidity stress. 2.46 As of September 30, 2015, there were 11,781 non-banking financial companies (NBFCs) registered with the Reserve Bank, of which 212 were depositaccepting (NBFCs-D) and 11,569 were non-deposit accepting (NBFCs-ND). There were 210 Systemically Important Non-Deposit accepting NBFCs (NBFCs-ND-SI) 38. All NBFCs-D and NBFCs-ND-SI are subject to prudential regulations such as capital adequacy requirements and provisioning norms along with reporting requirements. 2.47 The aggregated balance sheet of the NBFC sector39 expanded by 14.2 per cent on y-o-y basis in September 2015 as compared to 16.8 in March. Loans and advances increased by 14.2 per cent, while, total borrowings increased by 14.5 per cent (Table 2.12). 2.48 The financial performance of the NBFC sector deteriorated during the quarter ended September 2015 as compared to March 2015. The net profit as a percentage to total income declined from 18.8 per cent to 15.0 per cent between March and September 2015. RoA declined sharply from 2.2 per cent to 1.0 per cent (Table 2.13). 2.49 The GNPA of the NBFC sector as a percentage of total assets increased to 3.5 per cent in September 2015 from 3.4 per cent in March. The NNPA as percentage of total assets also increased to 2.0 per cent from 1.8 per cent during the same period (Chart 2.25). 2.50 As per the extant guidelines, NBFCs40 are required to maintain a minimum capital consisting of Tier-I41 and Tier-II capital, of not less than 15 per cent of their aggregate risk-weighted assets. 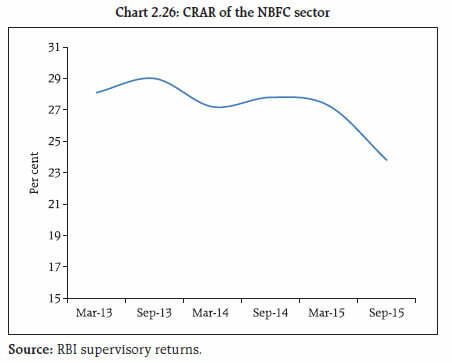 The CRAR of NBFCs declined to 23.8 per cent as of September 2015 from 27.3 per cent as of March 2015 (Chart 2.26). At the disaggregated level, eights NBFCs were unable to meet the regulatory required minimum CRAR of 15 per cent as of September 2015. 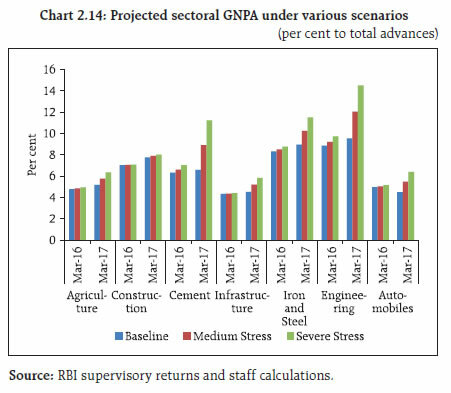 2.51 Stress test on the credit risk for the NBFC sector as a whole for the period ended September 2015 was carried out under three scenarios: (i) GNPAs increase by 0.5 SD, (ii) GNPAs increase by 1 SD and (iii) GNPAs increase by 3 SD. The results indicate that in the first and second scenarios, CRAR of the sector was marginally affected while in the third scenario, it declined to 22.7 per cent from 23.8 per cent. This however, was much above the regulatory minimum required level of 15 per cent. 2.52 A stress test on credit risk for individual NBFCs was also conducted for the same period under the same three scenarios. The results indicate that under scenarios (i) and (ii), around 6 and 9 per cent of companies, respectively, will not be able to comply with the minimum regulatory capital requirements of 15 per cent, while 12 per cent of the companies will not be able to comply with the minimum regulatory CRAR norm under the third scenario. 2.53 The interbank market43 is a major source of funding for banking institutions. The turnover in the market has shown a declining trend since March 2013. As at end September 2015, the turnover stood at ₹7.5 trillion indicating a fall of 4.2 per cent and 0.5 per cent compared to March 2015 and June 2015, respectively (Chart 2.27). 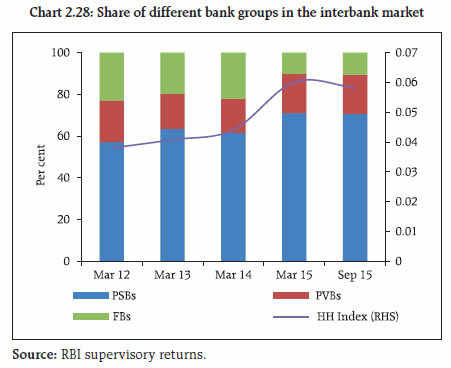 2.54 With a share of over 70 per cent, PSBs dominate the interbank market and this share is widely distributed as indicated by the Herfindahl-Hirschman Index (HH Index) of around 0.06 as at end September 2015 (Chart 2.28). 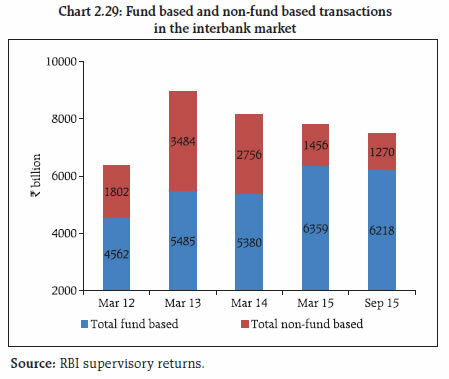 2.55 Fund based transactions, which constituted 83 per cent of the total interbank market, stood at ₹6.2 trillion as at end September 2015. The share of non-fund based transactions displayed a gradual decline since 2013 (Chart 2.29). 2.56 Though the interbank market is a major provider of short-term funds, an increasing trend is observed with regard to long-term transactions44 which grew to 54 per cent in March 2015 (compared to 45 per cent in March 2012) and further to 57 per cent in September 2015 (Chart 2.30). 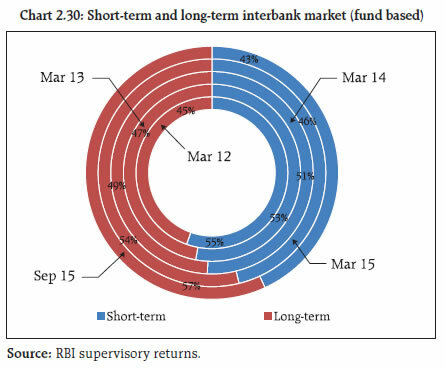 In absolute terms, the size of the total long-term fund based interbank market stood at over ₹3.5 trillion as at end September 2015. The contribution of loans and advances, capital and debt instruments and others such as deposits to the long-term fund based interbank market was 67, 23 and 10 per cent respectively. 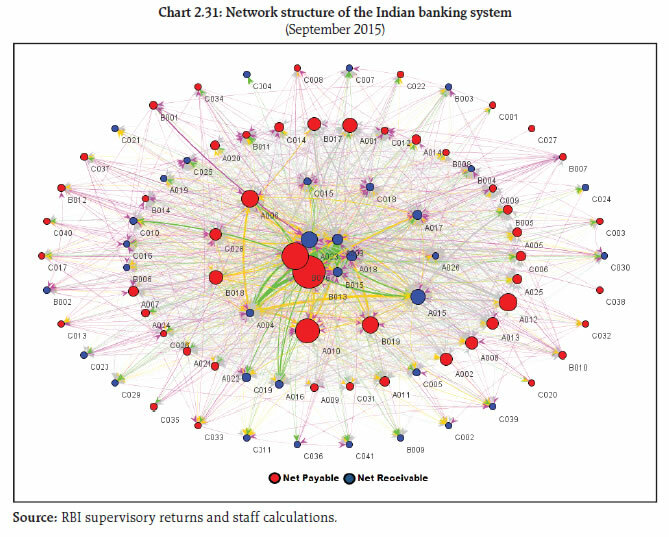 2.57 As far as the network structure is concerned, the banking system’s connectivity remained consistent over the last four years, with a few major banks dominating the system, though the level of connectivity varied from bank to bank. As can be seen from Chart 2.31, the most connected banks were at the inner core (inner most circle) of the network plot. Their number ranged between nine and six between March 2012 and September 2015 (Table 2.14). The connectivity ratio and cluster coefficient,45 measures estimating interconnectivity, remained consistent during the past three years. 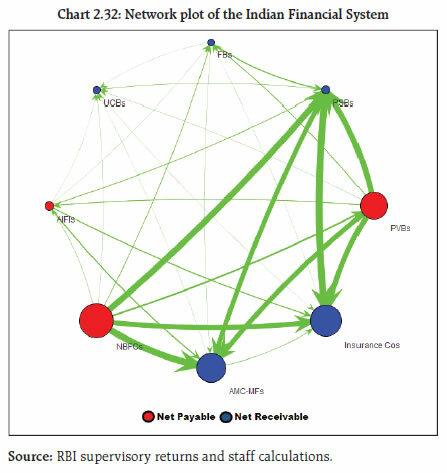 2.58 From the perspective of assessing interconnectedness in the larger financial system, fund transfers between banks, insurance companies, asset management companies managing mutual funds (AMC-MFs), NBFCs, UCBs and all India financial institutions (AIFIs) play a significant role. Insurance companies followed by AMC-MFs function as major fund providers, while SCBs followed by NBFCs are the major receiving entities. Within the banking system though the PSBs and foreign banks are net suppliers, the funds borrowed by private sector banks make the SCBs as a group the net receivers of funds from the larger system. The four AIFIs in the system also contribute to liquidity in the larger financial system (Chart 2.32 and Table 2.15). Note: The receivables and payables do not include transactions done among entities belonging to the same group. Source: RBI, SEBI and IRDAI. 2.59 AMC-MFs and insurance companies had a combined exposure of ₹4.4 trillion towards the banking sector as at end September 2015, which was 4 per cent of the total assets of the banking sector. From the perspective of the AMC-MFs and insurance companies, this exposure accounted for over 16 per cent and 10 per cent of their respective asset under management (AUM).47 While the exposure of AMC-MFs to banks is primarily through short-term instruments such as CDs, the insurance companies had a substantial exposure to longer term instruments of banks. Close to 90 per cent of the insurance companies’ exposure to banks was through longer term instruments. This underscores the dependence of banks on institutional investors, particularly insurance companies, for meeting their regulatory capital requirements (Table 2.16). 2.60 While the SCBs are the biggest gross receiver of funds from the rest of the financial system, NBFCs emerged as the largest net receiver of funds from the rest of the system. As of September 2015, the banking sector had an outstanding exposure close to ₹2 trillion to NBFCs. Further, the exposure of AMC-MFs and insurance companies to NBFCs displayed an increasing trend between March 2012 and September 2015 (Table 2.17). 2.61 A contagion analysis using network tools is a stress test which is carried out to estimate potential loss that could happen in the event of failure of one or more banks. Further, the extent of loss that could be triggered by a bank is also an indicator of its systemic importance. While a contagion could be triggered by the failure of any bank, the current analysis was conducted with the top net borrowers and net lenders as trigger banks. Theoretically, a net borrower bank will generate a solvency contagion while a net lender bank will generate a liquidity contagion. However, in reality, both solvency and liquidity contagions are likely to occur simultaneously as typically a bank is net borrower vis-à-vis some counterparties while remaining a net lender against some others. An analysis was undertaken to assess the impact of failure of the top borrower and top lender of the banking system on Tier-I capital of the system (Tables 2.18 and 2.19). The failure of the top net borrower bank could result in a loss of 33.3 per cent of Tier-I capital of the banking system (under the joint solvency liquidity contagion) while the failure of the top net lender bank could result in a loss of 35.3 per cent of Tier-I capital, subject to certain assumptions made with regard to contagion.49 It may be observed that failure of Bank C, the third among the net borrower banks, resulted in a more severe loss than the failure of the top net borrower bank due to the greater connectivity of this bank. 2.62 A study of contagion using interconnectedness among banks is important considering the co-movement of the risks of banks, especially during the times of distress. Examining co-movements suggests the use of dependency measures to capture changes in systemic risk. An analysis undertaken using return of equity prices of banks to understand their behaviour in boom and distress periods is given in Box 2.1. Asset price volatility reflects the process of pricing and transferring risk as underlying circumstances change. Patro, et al (2010) argues that high correlations among banks are necessary conditions for systemic failures because a single event is unlikely to cause broad-based dislocation over a relatively short period of time if correlations are low. They propose that stock return correlation is a useful indicator of systemic risk for market as a whole. The authors observe that the stock return correction is more forward looking and perception based. Expectations on asset returns played a crucial role in the recent financial crisis and hence the stock returns correlation could be a useful tool of analysis. Following this concept, a ‘systemic risk measure’ for SCBs was computed as the average correlation among daily equity price returns of SCBs. The average pair-wise correlations among the daily equity returns of the select SCBs in this case were calculated using a rolling window of two years. The systemic risk measure based on the average pair-wise correlations among the daily equity returns of 22 SCBs shows that the systemic risk increased between 2006 and 2009, but, started declining thereafter. The rise in systemic risk again started in the second half of 2011 indicating greater co-movement in banks’ equity price returns. It has been showing a downward movement in recent months (Chart 1). In order to distinguish the movement of correlation based systemic risk measure in boom time and down-turn time, a correlation of the systemic risk measure with NIFTY and Bank-NIFTY for the two sub-periods of March 2009 to October 2010 (boom time) and January 2008 to November 2008 (down-turn time) were estimated. The analysis shows that the co-movement amongst banks’ equity price returns was higher during the down-turn as compared to the boom period. This demonstrates that the correlation among banks’ equity price returns increases during the time of the financial distress/crisis and declines during the period of upturn. The correlations of systemic risk measure with real GDP growth (contemporaneous as well as one quarter lag) were found to be negative, which indicates that the systemic risk measure and the real GDP growth tends to move in opposite directions, that is, the systemic stress (in financial markets) is inversely related to economic activities (measured by real GDP growth). However, the relationship reflected through correlations is in non-causal terms and it does not show the cause and effect in the relation but only captures the direction and strength of co-movements. The relationships of the indicator, based on average pair-wise correlation of equity price returns of banks, with behaviour of financial markets (using NIFTY and Bank- NIFTY) as well as with economic activities (using real GDP growth) suggest that it could be useful as an indicator of systemic risks. Billio Monica, Mila Getmansky, Andrew W. Lo and Loriana Pelizzon (2012), “Econometric Measures of Connectedness and Systemic Risk in the Finance and Insurance Sectors”, Journal of Financial Economics, 104(3): 535-59. Chan-lau Jorge A. (2013), Systemic Risk Oversight, Risk Books. Patro Dilip K., Min Qi and Xian Sun (2010) ‘A Simple Indicator of Systemic Risk’, mimeo, Office of the Comptroller of the Currency and John Hopkins University. 1 Analyses undertaken in the chapter are based on latest available data. 2 Analysis is based on supervisory returns which cover domestic operations only. 3 Tier-I leverage ratio is defined as the ratio of Tier-I capital to total assets. Total assets include the credit equivalent of off-balance sheet items. 4 Here, the terms “advances” and “loans” have been used interchangeably. 5 For the purpose of analysing the asset quality, stressed advances are defined as GNPAs plus restructured standard advances. 6 Despite a worldwide revival in the aviation industry, stress continues in the Indian context on account of a few players. 7 A large borrower is defined as a borrower who has aggregate fund based and non-fund based exposure of ₹50 million and above. 9 The detailed methodology is given in Annex 2. 10 The quantum of shocks (as a multiplier of standard deviation) increased with time (quarterly period). 11 These stress scenarios are stringent and conservative assessments which are hypothetical. The severe adverse economic conditions referred to here should not be interpreted as forecast or expected outcomes. 12 The procedure adopted for estimating losses is given in Annex 2. Internationally, it is recommended that the estimated losses (EL plus UL) approach be used for the purpose of making provisions and capital for a period of one year ahead. For this, PD (probability of default) is derived based on annual slippage. As the purpose of this study is to judge the adequacy of provisioning and capital levels being maintained by SCBs and not to estimate the required level of provisions and capital to be maintained for the next one year, the PD used here is based on GNPAs. 13 Provisions include provision for credit losses, risk provision for standard advances and provision for restructured standard advances. 14 The stress scenarios are defined in Table 2.3 under macro-stress tests. 15 In order to make a comparison, UL & ES and total capital are given as per cent of total advances. The total capital to total advances ratio across the bank-groups may not be comparable because investments and off-balance sheet items are not taken into account. 16 Bank-wise estimation of EL and UL were undertaken for the 60 SCBs which cover 99 per cent SCBs’ total assets. 17 The sensitivity analysis was undertaken in addition to macro stress tests for credit risk. While in the former shocks were given directly to asset quality (GNPAs), in the latter the shocks were in terms of adverse macroeconomic conditions. Also, macro stress tests were done at the system, major bank group and sectoral levels, whereas the sensitivity analysis was done at aggregated system and bank levels. While the focus of the macro stress tests was credit risk, the sensitivity analysis covered credit, interest rate and liquidity risks. 18 For details of stress tests, see Annex 2. 19 The shocks designed under various hypothetical scenarios are extreme but plausible. 20 The SD of GNPA ratio is estimated from 10 years quarterly data. One SD shock approximates to 40 per cent increase in NPAs. 21 Data as of June 2015. 22 Data as of September 2015. 23 Data pertained to March 2015 quarter. 24 The income impact on banking books, considering the exposure gap of rate sensitive assets and liabilities, excluding AFS and HFT portfolios, is calculated for one year only. 25 The liquidity shocks includes withdrawal of a portion of un-insured deposits and also a demand for 75 per cent of the committed credit lines (comprising unutilised portions of sanctioned working capital limits as well as credit commitments towards their customers). 26 Presently un-insured deposits are about 69 per cent of total deposits (Source: DICGC, Handbook of Statistics on Indian Economy). 27 A bank failed the test when it was unable to meet the requirements under the stress scenarios (on imparting shocks) with the help of its liquid assets (stock of liquid assets turned negative under the stress conditions). 28 Guidelines on Basel III Framework on Liquidity Standards - LCR, liquidity risk monitoring tools and LCR disclosure standards were issued vide circular DBOD.BP.BC 120/21.04.098/2013-14 dated June 9, 2014. LCR is being introduced in a phased manner starting with a minimum requirement of 60 per cent from January 1, 2015 and reaching minimum 100 per cent on January 1, 2019. 29 For the stress testing exercise, the HQLAs were computed as cash reserves in excess of required CRR, excess SLR investments, SLR investments at 2 per cent of NDTL (under MSF) and additional SLR investments at 5 per cent of NDTL (following the circular DBR.BP.BC 52/21.04.098/2014-15 dated November 28, 2014). 30 Presently un-insured deposits are about 69 per cent of total deposits (Source: DICGC, Handbook of Statistics on Indian Economy). 31 A bank failed a test when it was unable to meet the requirements under stress scenarios (on imparting shocks) with the help of its liquid assets (stock of liquid assets turned negative under stress conditions). 32 Stress tests on derivatives portfolio were conducted for a sample of 21 banks. Details are given in Annex 2. 33 The detailed methodology and basic indicators used under different BSI dimensions are given in Annex 2. 34 FSR, June 2015 (with reference to data as at end March 2015). 35 System of 50 SUCBs. 36 Liquidity ratio = (cash + due from banks + SLR investment)*100 / total Assets. 37 The four scenarios are: i) 0.5 SD shock in GNPA (classified into sub-standard advances), ii) 1 SD shock in GNPA (classified into sub-standard advances), iii) 0.5 SD shock in GNPA (classified into loss advances), and iv) 1 SD shock in GNPA (classified into loss advances). The SD was estimated using 10 years data. 38 NBFCs-ND-SIs are NBFCs-ND with assets of ₹5 billion and above. 39 Data pertaining to all NBFCs-D and NBFCs-ND-SI only was considered to represent the NBFC sector. 40 Deposit accepting NBFCs and non-deposit taking NBFCs having asset size of ₹5 billion and above. 41 As per the revised guidelines issued on November 10, 2014, minimum Tier-I capital for NBFCs-ND-SI (having asset size of ₹5 billion and above) and all deposit taking NBFCs has been revised up to 10 per cent (earlier Tier-I capital could not be less than 7.5 per cent) and these entities have to meet compliance in a phased manner: 8.5 per cent by end-March 2016 and 10 per cent by end-March 2017. 42 The network model used in the analysis has been developed by Professor Sheri Markose (University of Essex) and Dr. Simone Giansante (Bath University) in collaboration with the Financial Stability Unit, Reserve Bank of India. 43 Banks, besides transacting among themselves over the call, notice and other short-term markets, also invest in each other’s long-term instruments. The interbank market as connoted in the current analysis is a total of all outstanding exposures, short-term plus long-term between banks. 44 In the present analysis all interbank transactions on account of money market instruments like call and notice money, CDs, market repos etc. have been reckoned as short-term fund based. The remaining fund based exposure that includes bonds, equity investments, loans and advances, deposits etc. have been reckoned as long-term fund based. 45 Connectivity ratio: This is a statistic that measures the extent of links between the nodes relative to all possible links in a complete graph. Cluster Coefficient: Clustering in networks measures how interconnected each node is. Specifically, there should be an increased probability that two of a node’s neighbours (banks’ counterparties in case of the financial network) are also neighbours themselves. A high cluster coefficient for the network corresponds with high local interconnectedness prevailing in the system. 47 1. Source of AUM of AMCs: Association of Mutual Funds in India. 2. AUM of insurance companies: Public disclosures made by individual insurance companies. 48 Details on the methods used in the contagion analysis are provided in Annex 2. 49 Please see Annex 2 for methodology.